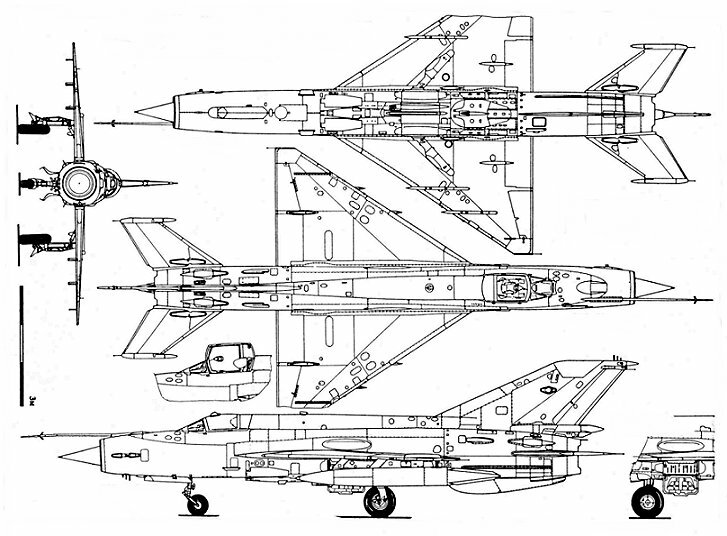 The MiG-21 was best second generation soviet fighter, and one of the main fighters in the world in the 60-80's. Begin to be created in 1954, its prototyp performs the first flight May 28, 1958 by the pilot V.A. Nefedov. 25 main modifications were built in series and 30 experimental versions. In the USSR in 1960-1983 were built 10,158 fighters. They were produced too by licence in Czechozlovakia (194 aircrafts Aero MiG-21F-13), India (600 HAL MiG-21FL, M and bis) and China (1,000 Jian J-7/F-7), with a total of MiG-21 built of over 12,000, that was the more numerous second generation fighter in the world. 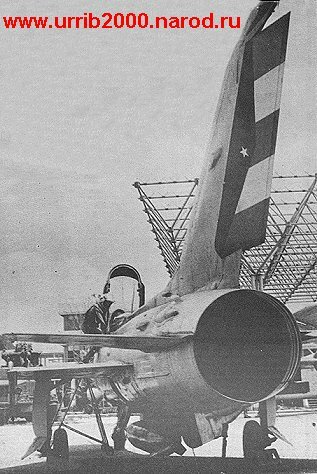 One of the MiG-21F-13 that arrived during the Cuban Missile Crisis. Air Museum, Havana. Picture: Ruben Urribarres. It has 17 World records registered by the FAI. Fought in almost all the important conflicts of the 60-90's. Numerically the MiG-21 has been the most important warplane in the Cuban Air Force for most of its existence. 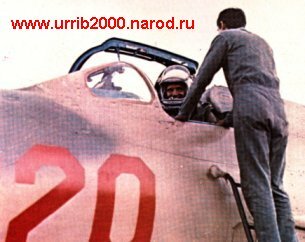 The first unit of the USSR in receiving the MiG-21 and to be list was the 32° Fighter Regiment of the Guard (32° Gv.IAP), of the Colonel N.V. Shibanov, based in Kubinka (near Moscow), that begins to receive the MiG-21F-13 in 1961. 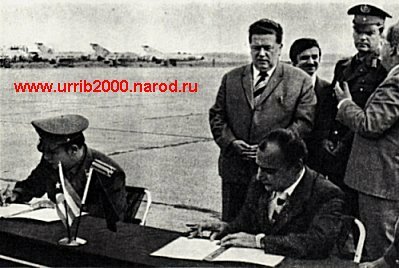 The Regiment already was ready in the first half of 1962, when in June of 1962 receives the secret order of disarming again the MiG-21F-13 and to be prepared to be transferred in train to the port Baltiisk and then to Cuba. 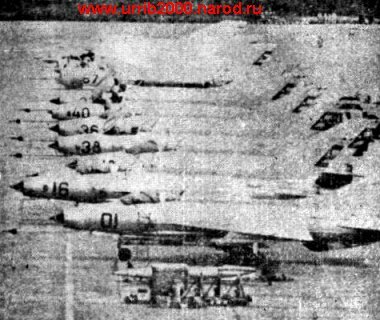 The Regiment has of 40 MiG-F-13, 6 trainers MiG-15UTI and a liason airplane Yak-12. For the secret operation, it was renamed then as 213° IAP. They leave at the beginning of September to Cuba and arrive two weeks later. The 213° regiment formed part of the 12° Anti-Aircraft Defense Division of the soviets troops in Cuba. The MiG-21F-13 are frantically assembled in Santa Clara and the September 18, 1962 the first MiG-21F-13 does its first flight in Cuba. To end of September already all the regiment was ready. On October 22 begins the Missile Crisis, and that was the first combat alarm. By the danger to be attacked in ground, the regiment is dispersed on October 24 between San Antonio, Santa Clara and Camaguey. 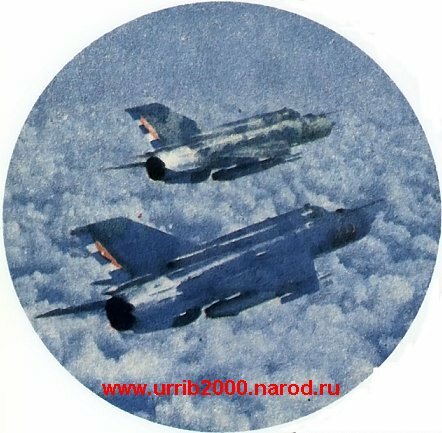 American airplanes performed daily recon flights over them, and November 4 by San Antonio two F-104C Starfighter of the 479° Tactical Wing are intercepted by a MiG-21F-13, that imitates to open fire, and the F-104C retire in full speed. 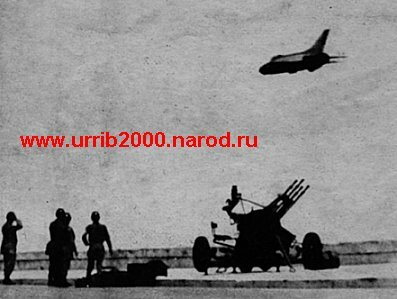 The Americans do not appear more over the MiG-21 bases. 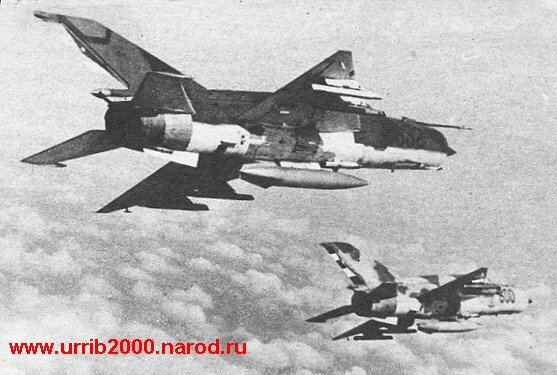 These MIG-21F-13 don´t carried any national insignia. This encounter has its consequences. 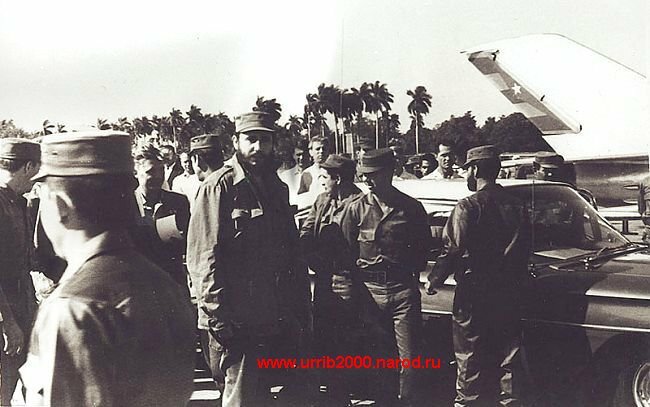 The Cubans and Russian monitoring the US radio notice, that the F-104C pilot reported being intercepted by 'Pirats planes without insignia'. Immediately all the MiG-21 were painted with the Cuban insignia. 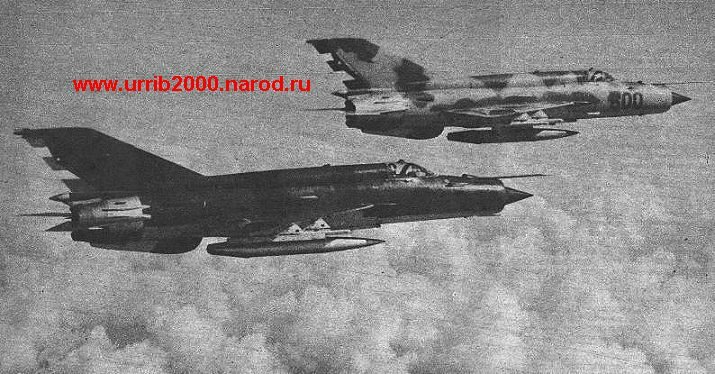 The supposed western reports that the MiG-21 in Cuba during that Crisis fought in any form against the American airplanes, have noy base. Neither the VVS neither the FAR claim any shoot down or fights, neither shot its arm never. 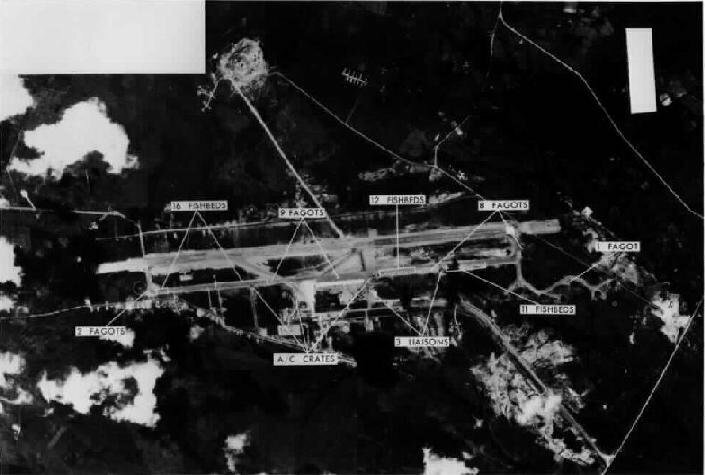 During the Missile Crisis the USAF discovered that the radars APS-95 (a modernized APS-20) of his EC-121 of the airborne early warning and Control (AEW & C, precursor of the AWACS) cannot detect low-flying MiG-21 because the ground clutter. As a measurement of emergency was developed the system QRC-248 to interrogate the IFF systems of the MiG-21. 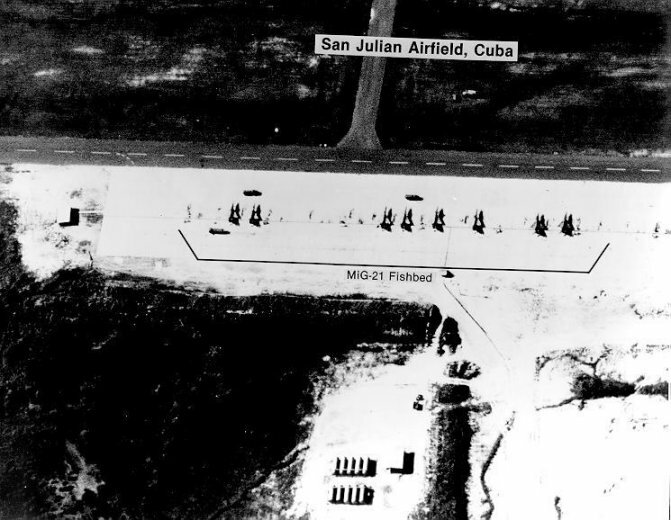 With this solution they can detect the low-level Cuban MiG-21, and that system was later employed in Vietnam. 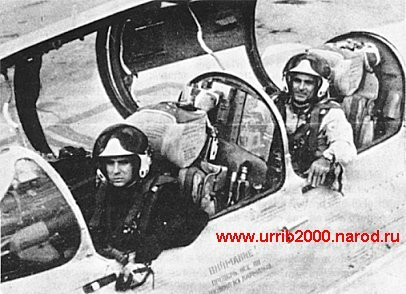 After the Crisis, at the beginning of 1963 the Soviet Government decide to transfer their equipment to Cuba, and to trained the Cubans pilots and technicians in the MiG-21. In April of 1963 Cuban pilot first soloed. 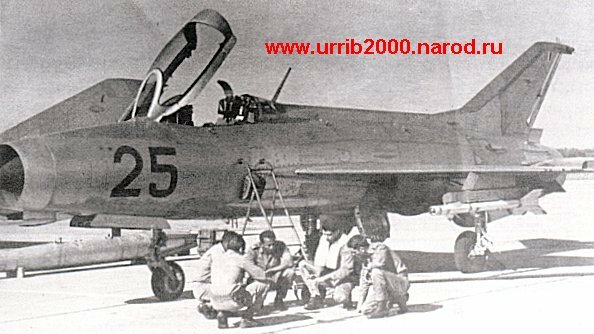 In summer already was ready the first FAR MiG-21F-13 Regiment, his Leader are Alvaro Prendes. 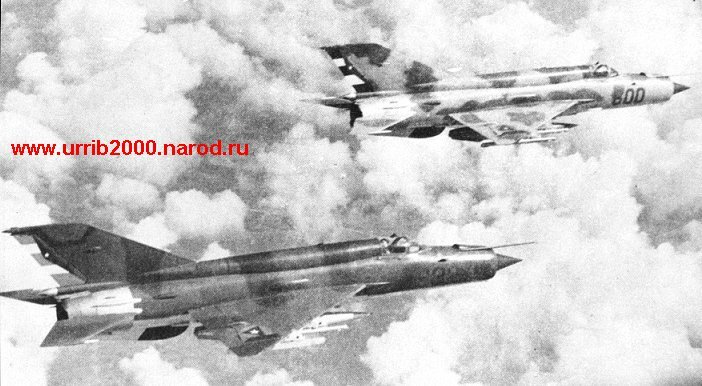 On August 10 the soviets finally deliver all the MiG-21F-13 and go home. 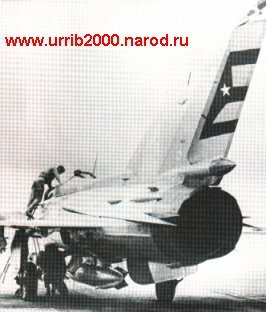 Entering the MiG-21 in service in Cuba officially on August 10, 1963, the FAR becomes one of its first users, at the same time that important allies of the USSR as East Germany, Czechoslovakia, China, Poland and the India, what shows the level of priority of the Cuban FAR in the USSR. 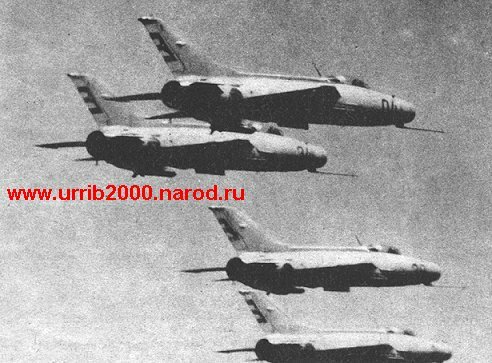 In the same summer of 1963 the MiG-21 piloted by Cubans do their first combat exercises over the Havans's coast, sinking a ship in company with the MiG-15bis. 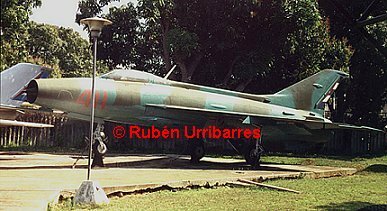 The participation of the Cuban MiG-21 in others conflicts are described in the articles about the Angolan War, the Ethiopian War (Ogaden), the"Operation Pico" against the Dominican Republic, and actions against Bahamas. 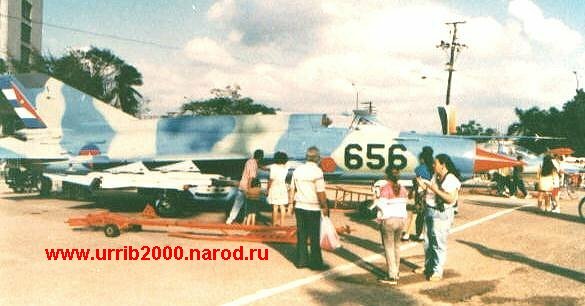 Little time after the arrival of the MiG-21F-13 in 1962, the park of the FAR is reinforced with new versions of this fighter, as the PF. 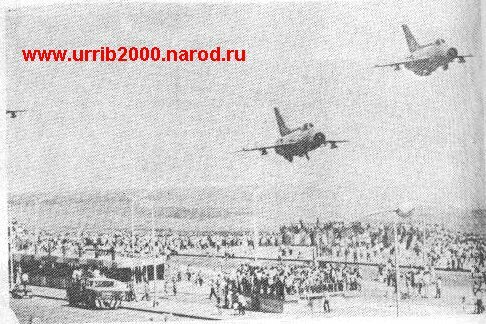 In 1966 arrives an MiG-21PFM Squadron, another Squadron with MiG-21PFMA, and the first two seats training versions MiG-21U. All are based in San Antonio. 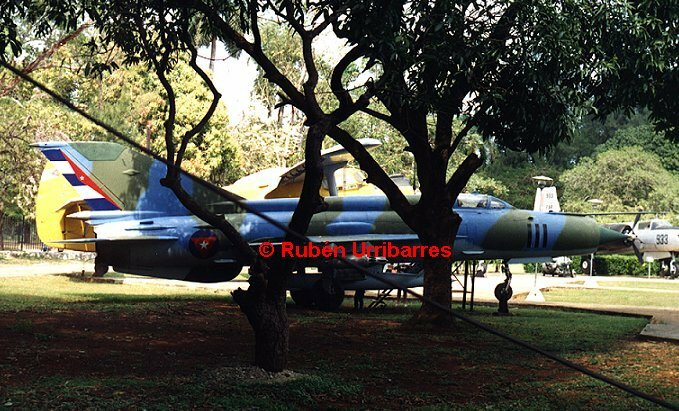 In 1967 arrives a second Squadron of MiG-21PFMA to San Antonio, and is transferred to Holguin an MiG-21F-13 Squadron. 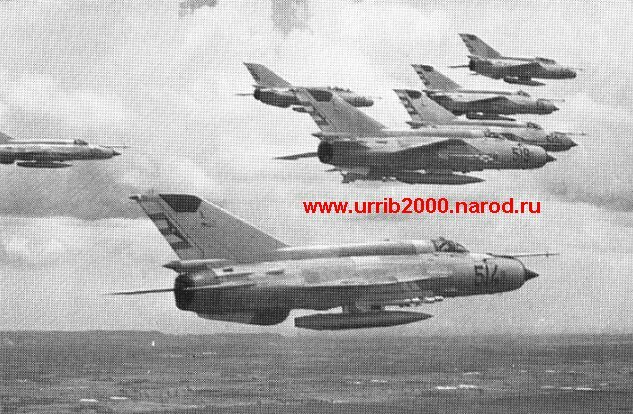 In 1968 arrive the MiG-21MF and two seats trainers UM for San Antonio, then passes to Holguin the second MiG-21F-13 Squadron. Arrive the Recon Fighter MiG-21R, that helps in the exploration and maneuvers. In 1975 arrives two MF Squadrons, one is sent to Angola in January of 1976. In October of 1976 in San Antonio are assembled the better version of this fighter, the MiG-12bis, of the third generation. Other Squadrons of MiG-21bis follow being received in the 80's, and in 1989-1990 various fighters return from Angola, being the more numerous equipment of the FAR. 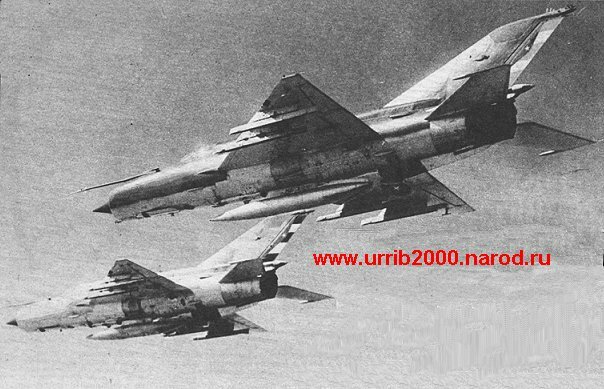 By 1990 were in service some 150 MiG-21 in service in 10 Squadron of 5 Regiments (30 MiG-21 in each): They are 90 MiG-21bis, 60 MiG-21MF and 10 two seats MiG-21UM Mongol B. Their mission are air defense, and attack. Almost all these equipment are in good state, in part are in conservation to save the parts stocks and the motor resource, that are received in very limited quantities since 1990. MiG-21F-13 Fishbed C (type 74). Diurnal fighter without radar, with radiometr SRD-5M Kvant. Built in 1958-1965 in three factories of the USSR. Canopy of one piece, open toward to protect pilot. Two missiles under wings. MiG-21PF Fishbed D (type 76). Radar Sapfir RP-21. Built in 1962-1964. Better engine. Without internal gun, alone suspended, two missiles under wings. Canopy of two pieces, additional fuel. MiG-21PFM Fishbed F (type 77). Built in 1964- 1968. Radar Sapfir RP-21M. Four point under wings for missiles, internal gun. New engine with the system SPS for the blown of the flaps. Parachute in the tail base. MiG-21PFMA Fishbed J (type 96). Export version of the PFM. Built in 1968-1971. Radar RP-22S. System SPS, more combat load. 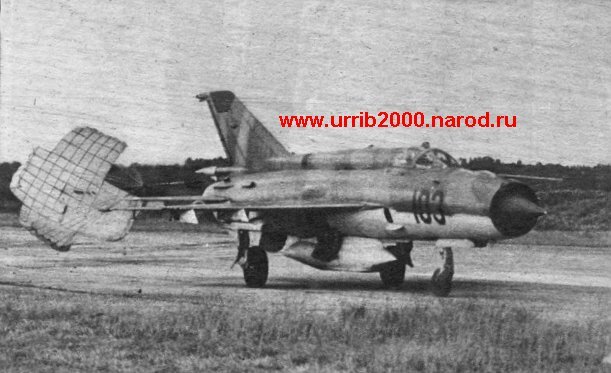 MiG-21R Fishbed H (type 94R). Version based on the recon PFM version, with pod under fuselage that load photo and TV cameras, IR sensors and laser or SLAR, equipment of electronic countermeasures under wings. MiG-21bis Fishbed N (type 75B). Third generation fighter, the best version, optimized for agile combats at low level, combat load expanded. Radar Sapfir-21. Additional fuel and new engine. MiG-21U Mongol A. (Type 66). Two seat training version of the F-13. First flight October 17, 1960. Built in Moscow in 1964-1968. Fuel reduced to 2350 liters, two point under wings, without radar. 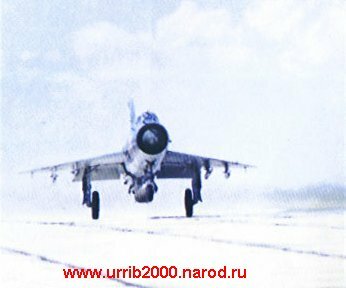 * The MiG-21bis engine have an adicional afterburning regime with 9,900kg thrust during 3 minuts. 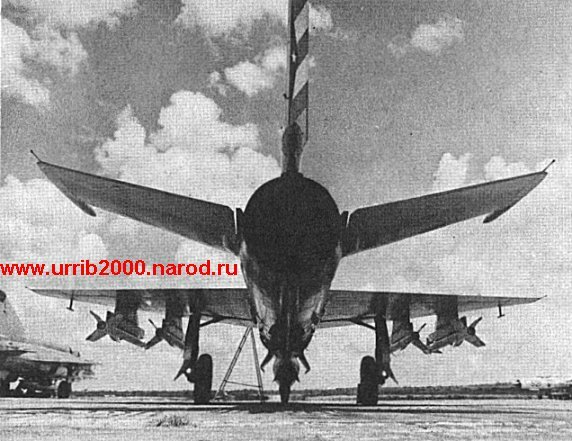 MiG-21R GP-9 with GSh-23 gun x 23mm with 200 rounds in the place of the recon pod. Two air -air missiles K-13 or R-3S.